Experience Muskoka Golfing. Guide to Great Golf Courses Muskoka area. Why not experience Muskoka golfing – a backdrop like no other – when you are in the area for a vacation or even a quick visit? If you are into exploring the Muskoka region and you’ve already fished or swam or paddled or hiked until your heart’s content, try something a little more formal but just as exhilarating – golfing one of the many fabulous courses in the region. There is something peaceful about being in such beautiful surroundings, even if you just sliced your last shot off the 9th tee. In this beautiful environment, is that really such a bad thing? How could it be? You’re in Muskoka and time has slowed down. Even if your game isn’t firing an all cylinders you are outside, exercising, getting fresh air in one of the most treasured recreational areas in North America. 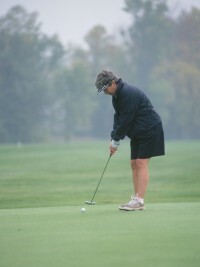 There are a number of select compaines who specialize in golf vacations in the Muskoka region. The golfing in Muskoka covers a range of courses from public to private, from 9 hole executive par-3 courses, pitch and putt, links, Canadian Shield layouts to championship 18 hole golf courses designed by some of the world’s greatest golf architects. Mark O’Meara designed the Grandview course and Nick Faldo was the mind behind The Rock. But other golfing legends like Stanley Thompson, C.E. Robinson, Bob Cupp, Ron Garl and Thomas McBroom have all left their mark on the Muskoka golfing landscape. So it should come as no surprise that Muskoka ranks with Canda’s best golfing destinations and has become a hot bed for golfing. But don’t let it intimidate you if you are just new to golf. There is plenty of variety among the many golf courses that you are sure to have a great time. If you are touring Muskoka, throw in a golf game. Golfing is super way for families, fathers and sons, mothers and daughter, young and old to spend time together challenging yourself at one of the world’s most popular and enduring pastimes, all while appreciating some of the most envied scenery and landscapes in the world. But where do you start if you want to learn more about Muskoka golfing? Try our golfing guide which is growing all the time. It shows you the courses near each particular town. Just click on any of the course names and get more information about it. By the time you venture this way for your next holiday, you will have a good idea of where you want to go for your Muskoka golfing experience.